We’d love your help. Let us know what’s wrong with this preview of A Field Guide to Medicinal Plants and Herbs by Steven Foster. To ask other readers questions about A Field Guide to Medicinal Plants and Herbs, please sign up. how can I read this? I can't open it. To put it mildly, I'm not a fan of identifying plants by color. By lacking any other passable plant guides for this continent (it's quite a regrettable gap in the US publishing tradition), it would do. It was useful for me on several occasions. Actually, it's the best botanical field guide I've seen here. But it's still so far from a really good guide, I can't give it more than three stars. This is a great reference. I didn't read all 530 entries, but the book includes a great preface, how to use this book section, and index, and contains loads of illustrations and photographs. I learned a good deal while perusing the volume, reading the preface and how to, and reading the captions for all of the photographs. I am confident I will learn a lot on our next hike by taking this along. I already found pictures of plants we have encountered on past hikes and which we found noteworthy. This guide warns that some plants look similar and can be deadly. For the severity of this warning, it has very hard to see pictures and poor descriptions. The organization, by flower color and plant type, would make more sense if you already knew what you were looking for. All in all I found it interesting to read the many uses for plants but could never see it being a practical guide to take out in the wild and harvest anything. Gave me info on the plants The Harvester collected on his property, as well as others. It is amazing how God gave us these herbal plants to cure disease and common ailments. This field guide is pretty good - all color photos, the essential info you might want. The book aims to be more extensive than thorough. I would prefer a field guide with larger and more photos of the plants themselves. Many of the photos do not provide very good leaf close-ups. This is why I only gave this guide 3 out of 5 stars. This guide was recommended at a herbal salve making class I took. I'm so glad I purchased it as it is a beautifully illustrated, informative, well organized reference on medicinal herbs and plants. It is also the perfect size for carrying with you on hikes. Highly recommended. This is an excellent field guide to medicinal plants. The information on how to use them is sketchy, as it lacks dosages and other information needed to confidently recommend herbs, but for a professional herbalist who understands how to prepare and use plants it's a great resource. This field guide unfortunately uses (sometimes poor) color photos instead of drawings to represent each plant. A thorough survey, but it will need to be supplemented with other guides for accurate ID. a great and easy to use field guide with many pictures. Small field guide packed with information and identification photos for plants with medicinal qualities. Not useful as a reference book for home use. The choice of plants seems strange, the layout is not easy to follow and the descriptions are choppy. good guide with lots of photos, good descriptions. would be better if included specific preparation methods and dosage. This is a good book of North American medicinal plants. It contains pictures, genus names, and uses. I enjoyed it, and will be buying a copy for my personal use in the field. awesome read my friend, awesome read. 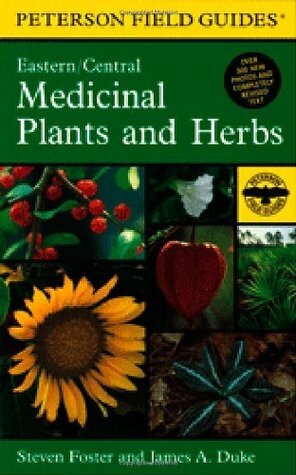 Another good reference book for identifying medicinal plants. Cautions noted on their use. Best-selling author, photographer, consultant, and herbalist, Steven Foster, has 39 years of comprehensive experience in the herbal field. He started his career at the Sabbathday Lake, Maine, Shaker’s Herb Department—America’s oldest herb business dating to 1799. As an international consultant in medicinal and aromatic plant technical and marketing issues, Foster has served on projects in Argentina Best-selling author, photographer, consultant, and herbalist, Steven Foster, has 39 years of comprehensive experience in the herbal field. He started his career at the Sabbathday Lake, Maine, Shaker’s Herb Department—America’s oldest herb business dating to 1799.